Our Open Cockpits Weekend events will be held from 10.00am until 4.00pm giving guests plenty of time to gain access / close view the aircraft selected and enjoy all the Museum hangars and facilities. For our June Open Cockpits event the aircraft open for access will be in the National Cold War Exhibition, Hangar 1 (transport and training) and in the Museum grounds. During the day, guests will be able to speak many of our experienced and highly knowledgeable staff and volunteers who will be able to share aircraft information and answer any questions you may have. We will be running another Open Cockpits Weekend event during October which will focus on a section of aircraft in our Test Flight and War in the Air hangars. More detail on this can be found by clicking here! Tickets for this event are ideal for an unusual gift and they are on sale now via the website. If you are purchasing tickets as a gift please email us with the details of the person you are buying for and you will receive a PDF certificate stating the experience name, date and time. Access into the cockpits is via sets of ladders, you must be physically able to climb these and lift your legs in and out of the cockpits. A minimum height requirement of 1.07 metres applies. Please note that size of cockpits vary, if the museum feels that it is not safe or possible for you to access a cockpit we reserve the right to refuse access. Please read the terms and conditions on the ticket booking page before making payment. Admission is by advance ticket only; tickets cost £13.50 per person. Please note parking charges are included in the ticket price. All those attending the event will require a ticket. Children under 16 must be accompanied by an adult. 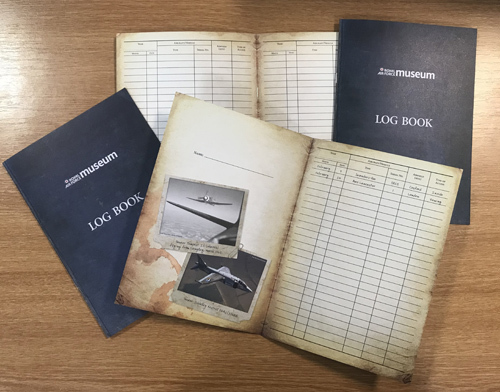 We have produced a special Log Book which can be purchased for just a £1.00 in advance, allowing you to keep a record during the event!